These first two windows are a good example of how glass detailing can provide any degree of privacy or vista depending on the glass selection. Both windows are 10' x 6' and are installed into custom wood sash. One installation looks out to landscaping. In this case the view was enhanced with the use of glass detailing. There is a palette of gray plate glass combined with clear and tinted handblown glass. Numerous hand beveled prisms add a spark to the design and make prismatic projections into the environment. 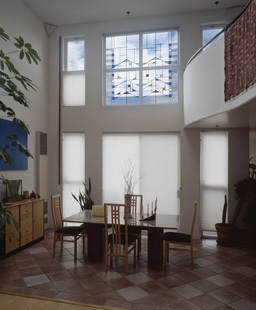 The second window uses an opaque white glass for the background for privacy. Beautiful filtered light enters the room, once again beveled jewels are used along with tints of gray handblown glass. This kind of detailing can be used functionally as well as decoratively to control the view or eliminate the need for curtains or blinds. 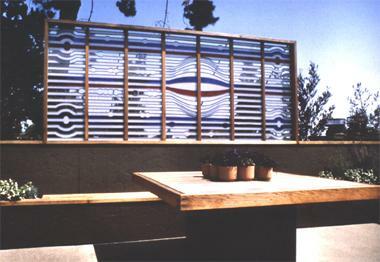 These installations are part of a family of leaded glass designs that are variations on a theme. This window is located in a loft owned by a jazz aficionado. There are numerous viewing positions, from below as well as from upstairs on the balcony. The window looks out to Twin Peaks, a San Francisco landmark, with the city below. The design is inspired by, and intended to represent, a musical abstraction of the view. This large panel is beside the entrance door looking out to the garden beyond. At night, lit from inside, it announces the entrance to guests. This window represents my most recent work, where I fracture and reassemble the traditional Craftsman or Prairie School inspired patterns. In these designs, I also use an expressive extended leadline detail, to add abstraction to the more symmetric traditional adaptations. This is a very contemporary look; the work is a balance between order and chaos. I have taken inspiration from De Stijl abstract painters like Mondrian, Van Doesberg and Van Der Leck. The extended leadlines are inspired by the glass designs of German artist Johannes Schreiter. 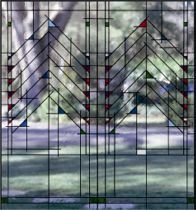 This window is built of French hand blown glass with beveled glass prisms and looks out to a garden beyond. The design is inspired by the wisteria growing outside the opening. This window looks out to an undesirable view. Special consideration was used to select a palette of materials that would hide the view and create the effect of a field of flowers beyond the window opening. Colors were selected to match the interior design color scheme.